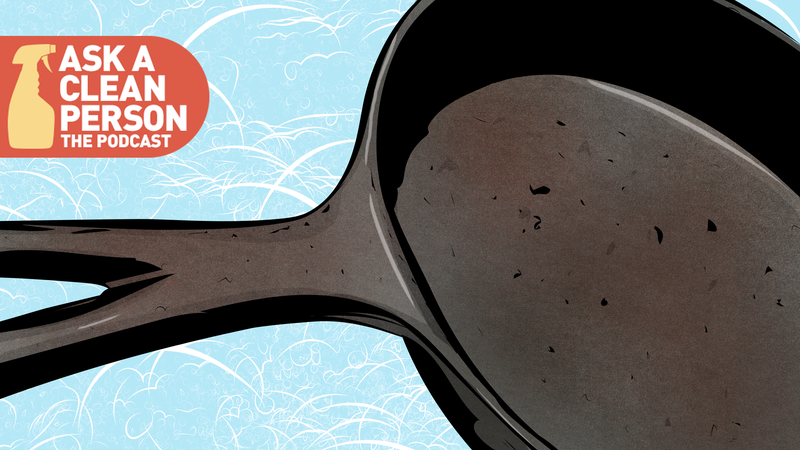 My guest this week on the official Ask a Clean Person podcast is Daniel Gritzer, the culinary director at Serious Eats, who joined me to share the vast amount of knowledge he’s collected over the years about caring for cast-iron cookware. New, old, seasoned, unseasoned, rusted, you name it—Daniel can tell you exactly what to do, and what not to do, to ensure that your stuff is in the tippiest-toppiest shape it can be. Over at Serious Eats, they’re real, real serious about their cast iron. (They’re also real, real serious about their obsessive approach to cooking, as evidenced by the sheer size of Managing Culinary Director Kenji Lopez-Alt’s new cookbook, The Food Lab. It is monstrous, in the best possible way.) As promised in the episode, I’m including their definitive articles about caring for and restoring cast-iron pans, as well as Daniel’s recent recipe for Southern-style cornbread, which is, of course, the perfect thing to make in your cast-iron skillet.